True ownership of one share of Shake Shack stock framed like you want. The recipient becomes a real shareholder of the company. 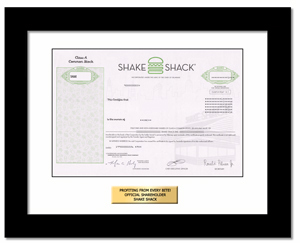 The Shake Shack certificate is unique and edgy, just like the company. It represents a snapshot of history incorporating the company's name, logo and corporate seal.